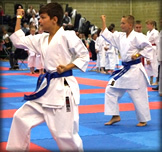 On Sunday the 6th March, yes Mother’s Day, those who felt brave enough to ignore the significance of the day headed down to Gloucester for this year’s KSE9 (Karate Shitokai England) event. Fortunately most of the abandoned mothers did receive their rewards when the party returned, as almost all of our competitors returned home with trophies or medals for their efforts. 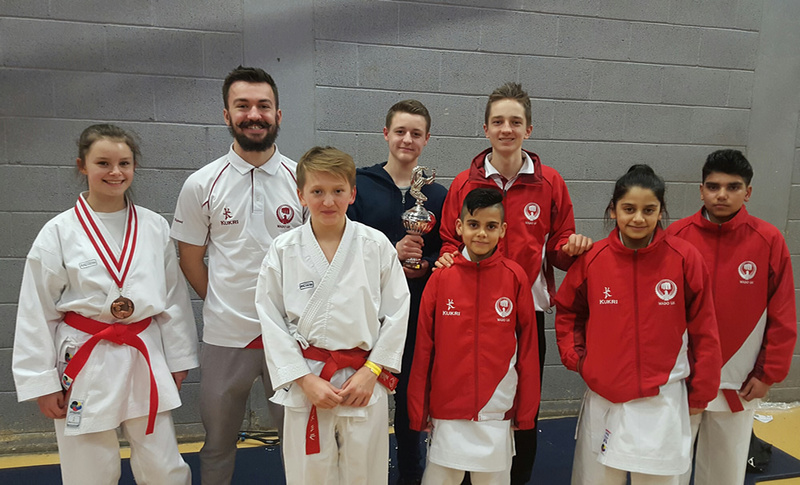 Our Wado UK contingent consisted of Amie Newton, Brad Emmerson, Ben Harrison and Jordan Taylor from the Shinken Dojo, and Teerth, Charan and Amrit Dhesi, along with Ellis Miller from the East Hull Woodford and Hull Zanshin Dojos. With over 500 competitors in a total of over 900 categories, the day was always going to be a long one. It started at 9:30 am, but unfortunately didn't finish while 9:15 pm! That said the day was a good one, and the five tatamis did keep moving along at a steady pace. Our competitors were well spread across the tatamis because of the age and gender splits, but it didn’t take too long for the rewards to start arriving. Kata trophies and medals were of course the first to arrive, with 2 gold wins for Brad Emmerson in what was his first ever competition, and Amrit Dhesi who in fairness is a bit of a 10 year old veteran. These was added to by the final reaching performances of Ellis Miller, who stumbled at the last hurdle to take the silver. Our pairs event of Charan and Amrit Dhesi was unfortunately short of the mark on this occasion, but joining forces with elder brother Teerth to form a team was to prove more fruitful. Following the team event, they had managed to secure a bronze medal for the tally and keep things moving along nicely. Kumite would provide more medals, though not as many as we would have liked. Ellis Miller managing to secure our best result, with his and our second silver medal of the day. The final individual medal went to Amrit, who on this occasion had to settle for a bronze. The team event is unusual at this competition, as the format does dictate that the teams are of mixed gender. Two males either side of the one female competitor who must compete at number two on the line up. We did only have the one team, and that was in the 12-14 years category. Doing us proud though were Amie Newton, and her team mates Ellis miller and Teerth Dhesi. Again a medal winning performance from them added another bronze medal to the overall tally. That is where our medal came to an end for the day, though it was still around 8;00pm. A good result though and one which saw our 2016 medal tally see a steady improvement. Thanks must go to Paul Braid and Gaynor Dent for their coaching input, along with all the mums of course who were abandoned for the day.